The unchanging Om is the All. Its expansion is, what has been, what is, what shall be. And what is beyond the three times, is also Om. For all this is the Eternal; and this Self is the Eternal and this Self has four steps. Standing in Dream Life; perceiving inwardly; sevenfold; with nineteen mouths enjoying subtle things; manifested as the Luminous;—this is the second step. When, finding rest, he desires no desires and dreams no dreams, this is Dreamless Life; finding union; knowing uniformly; blissful; an enjoyer of bliss; whose mouth is knowledge; who is manifested as Intuition;—this is the third step. This is the All-ruler: this is the All-knower; this is the Inner Guide; the womb of all; the manifester and withdrawer of lives. Nor perceiving inwardly nor perceiving outwardly, nor perceiving in both ways; nor uniformly perceiving; nor perceiving nor not perceiving. Unseen, intangible, unseizable, unmarked, unimaginable, unindicable; whose Self is its own proof; in whom the fivefold world has ceased; restful, blessed, secondless; this they count the fourth step; this is to be known as the Self. This Self is as the unchanging Om, and as its measures; the steps of the Self are as the measures; the measures are as the steps. These measures are: A—U—M. The Earthly Fire, that stands in Waking Life, is as ‘A’, the first measure from its arising first, and attaining. He attains all desires, and arises first, who knows it thus. The Luminous, that stands in Dream Life, is as ‘U’, the second measure, from being upward, and from uniting both. He raises upward the continuation of knowledge, nor has he a son ignorant of the Eternal, who knows it thus. The Intuitive, that stands in Dreamless Life, is ‘M’, the third measure; from being the measurer, and of the same nature. He measures all, and becomes of the same nature, who knows it thus. Unmeasured is the fourth, the intangible, where the fivefold world has come to rest; the bright, the secondless. Thus Om is as the Self. By the Self he wins the Self, who knows it thus. Let Mind be regarded as the, Eternal; this for the microcosm. Then, in the macrocosm, Shining Ether is the Eternal. Thus both are taught, the microcosmic and the macrocosmic. This Eternal has four steps. Productive Voice is a step; Vitality is a step; Seeing is a step; Hearing is a step. Thus in the microcosm. Then in the macrocosm. Earthly Fire is a step; Air is a step; Sun is a step; eternal Space is a step. Thus both are taught, the microcosmic and the macrocosmic. Productive Voice is one of the Eternal’s four steps. It gleams and glows through Earthly Fire as its light. He gleams and glows in fame, glory, and eternal light, who knows thus. Vitality is one of the Eternal’s four steps. It gleams and glows through Air as its light. He gleams and glows in fame, glory, and eternal light, who knows thus. Seeing is one of the Eternal’s four steps. It gleams and glows through Sun as its light. He gleams and glows in fame, glory, and eternal light, who knows thus. Hearing is one of the Eternal’s four steps. It gleams and glows through eternal Space as its light. He gleams and glows in fame, glory, and eternal light, who knows thus. The work of translating, always difficult, is doubly difficult in the case of the Upanishads. For every word, first thrown out as the glowing symbol of some great reality felt by the heart, has there a flavor and color of its own; a halo of thought, making it luminous in the minds of those who first conceived or heard the symbol. But when translated,—unless by the happiest choice,—the whole flavor and aroma of the word, and all the depth of reality that lies behind it, may be lost. We can only restore the real meaning to the translated word by weaving round it the same vesture of thought, and endowing it with the same color and life; till our translation gradually comes to represent the original truly. This is particularly true of the Mandukya, briefest and most concise of all the Upanishads. Every word is brimful of history, brimful of thought; so that no translation can give more than a pale and imperfect outline of the original. It falls naturally into two sections: the fourfold-seeming Eternal, and its fourfold symbol, Om. The first section begins with the unity of the Eternal, the Self of all beings. Through that power that Shankara the Teacher calls Beginningless, Ineffable Illusion, this Eternal appears in four modes or forms of consciousness: Waking, Dream, Dreamless Life; and, lastly, pure Divinity. Waking is the life of this world. Dream is the life of the world between earth and heaven. Dreamless life is the life of heaven. And pure Divinity is the life of the Eternal itself, free from the last shadow of illusion. The lowest and outermost of the four modes or states of consciousness is Waking Life; where the Eternal, mirrored in the Self, gleams and glows as Earthly Fire, in the quaint words of another Upanishad. 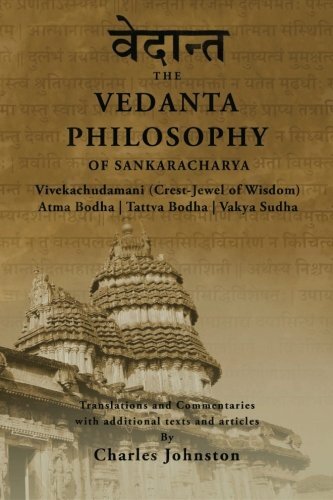 In this outward physical life, the vehicle and vesture of the Self is the physical body; and the endless variety of animal, physical life is here summed up in half a dozen words. It perceives outwardly, “eating outward things with nineteen mouths”; meeting the outward world through nineteen powers: the five perceptive powers that “hear, see, smell, touch, and taste”; the five active powers that “speak, take, enjoy, put forth, and move”; the five vital powers; and the four inward powers, the wandering soul, the doubting soul, the affirming soul, and the physical self-consciousness; that is, five perceptions, five active, five vital, and four inward powers; “nineteen mouths” in all. If he meditate on Om with one measure, he is quickly reborn in the world. He comes to the human world and enjoys greatness. To meditate on one measure of the symbol Om thus means to live completely in the outward life of the senses, the life of the natural physical world. And the Vedic Master tells us that those who live thus are quickly reborn in the human world. This Waking Life, represented by the first measure of Om, is the first mode or state of consciousness, the first step of the Self which is the Eternal. It is the life of outward day; it is also the whole outward life of a single birth, a day in the life of the Eternal. As the rays of the setting sun are all gathered up in his luminous circle, and come forth again when he rises, so all this is gathered up in the higher bright one, Mind. So that the man neither hears nor sees nor smells nor tastes, nor speaks nor takes nor enjoys, nor puts forth, nor moves. He sleeps, they say. So this bright one, Mind, enjoys greatness in Dream. Things seen he sees again. Things heard he hears again. Things perceived he perceives again. Things seen and unseen. Things heard and unheard. Things real and unreal. He sees it all; as All he sees it. In Dream Life, the Self meets the world of dream in a vesture fashioned by the mind after the model of the body. A body of dream, with active, perceptive, vital, and inner powers, made by the imagination after the outward model. He sleeps, they say; and this is not only the sleep of a single night but the long sleep of death that separates birth from birth. In the mystical syllable Om, this sleep is the second letter, the second measure. And he who meditates on two measures of Om gains Paradise, the world between earth and heaven. This is the lunar world, and after enjoying brightness in the lunar world he is born again. But when Mind is wrapped by the Shining One, then he dreams no dream; then within him that Bliss arises. And as the birds come to rest in the tree, so all this comes to rest in the Higher Self. For this Self is at once seer, toucher, hearer, smeller, taster, knower, doer. This is Dreamless Life, the third step of the Self. In the life that is beyond dream, the Self no longer meets the outer world in a vesture modelled like the body; no longer perceives through a fivefold avenue of senses; no longer acts through a fivefold avenue of powers. The perceptive powers are united into one, the pure power of knowing, “at once the seer and hearer, toucher and taster”. The active powers are united into one, the pure power of will. Thus in Dreamless Life, the Self “finds union and knows uniformly”. It is also an “enjoyer of bliss”. For if one were to choose a night in which he dreamed no dream at all, and to compare it with all other nights and days of his life, and then had to say how many days and nights of his life were better and happier than that night, I think that he would not find them hard to count. And this not only for a simple man, but even the great King himself. And if death be like this, I say it is a wonderful gain. Thus in Dreamless Life, the Self is “blissful, an enjoyer of bliss”. It is pure will and knows purely as Intuition. In this Dreamless Life, says Shankara the Teacher, its vesture is woven only of the ineffable illusion, which hides from the Self its absolute Oneness with the Eternal. And this thin web of illusion, the Causal Vesture, as he calls it, stands throughout the whole circle of births and rebirths; putting forth again and again the lower bodies in which the same Self learns its lessons in dreaming and outward life. Therefore it is, in the words of the Upanishad, “the womb of all; the manifester and withdrawer of lives”. This third mode of consciousness is symbolized by the third measure of Om. And if one meditates on the three measures, and through this unchanging Om meditates on the highest Spirit; he, endowed with the Shining, with the Sun, puts off all sin as a snake puts off its slough. And as the lunar world is the changing paradise of the emotions, shining with reflected light, so the Sun is the steady self-shining of the perceiving Self. And this perceiving Self rests in the higher unchanging Self, which is the fourth step of the Eternal. Here, above the waves of the ocean of birth and rebirth, beyond the three times—what was, what is, what shall be—the divine life of the Self is perfected in quiet eternity. Here will and wisdom are one. There is no division between knower and what is known. Therefore there is no knowledge, but yet there is the divine and perfect essence of all knowledge. There is no division between will and what is willed; between doer and the thing done. Therefore there is no will and no doing, and yet there is the divine and perfect essence of all will and all doing; for the Self has become one with the Eternal; has renewed its immemorial oneness with the Eternal; and there is no room for limit or division or anything less than the Eternal. Thus the fourfold-seeming Eternal, and the fourfold-seeming Self, which is the Eternal. The Eternal appears in four modes; first the outer world; second, the inner world between earth and heaven; third, the divine world, heaven; fourth, its own ineffable, divine Self. And the Self appears in four modes; first waking, outwards life, of a single day or a single birth; second, dream-life, of a single night, or a single period of paradise between two births; third, the dreamless life, the life beyond the dreams of night and the dreams of paradise; and, fourth, the divine life as the Eternal. And these four modes of the Eternal, and the four modes of the Self that is the Eternal; their fourfold seeming, and their real unity, are symbolized by the mystic Om and its measures. This is part of the meaning of the mystic symbol Om, the theme of the Mandukya Upanishad. But we shall only give the true and final meaning of this teaching, of the four modes of consciousness, and the four steps of the Self, when we recognize that they are really four great stages of culture; four great spaces on the path of life, that the soul must pass on its homeward journey to the Eternal. The first, outward or waking life, is the life of the innocent animal man; where the divine Self, hidden under the thickest and heaviest vesture, learns the eternal lessons, gains the eternal powers, through outward nature; and comes in contact with the lasting realities hidden under sky and mountain, rock and river, sunshine and storm. This innocent animal man lives without reflection, dies without fear, and is reborn without dreams of paradise, to take up his work again. His animal, physical life is entirely innocent and admirable, so long as it does not bar the way to any higher and more divine mode of the Self. Then the second step, the great dream, begins when the dawning mind learns to wring their meaning from the stars and seas, the rivers and rocks; the life of thought and emotion, of imagination and fear, religion and poetry, is gradually built up with symbols gathered from the flowers, the thunder-storms, the sunlit waves of the sea, the quiet laughter of the stars. Then human life begins; the life of hope and fear, of love and hate, of desire and disappointment, of this outward world and paradise; a shining dream, a dream that lasts for ages. After dream comes the awakening; the awakening from hope and fear; from love and hate; from desire and disappointment; from the feasts of this world and paradise. What then of the awakening, after the fair dream of life? Instead of hope and fear—the hope to win, and the fear to lose—there is perfect possession; instead of love and hate—love with its terrible shadow, separation; hate with its terrible shadow, fear—there is perfect unity that knows no separation; that laughs at the transparent shadows of space and time. Instead of the feasts of this world and paradise, there is the perpetual presence of the divine essence of both; a perpetual dwelling in the world the seers tell of, above the ocean of birth and rebirth. This is the true dreamlessness; and if a man were to compare that dreamlessness with all the days and nights of his life, he would be constrained, I think, to say how much better and happier that dreamlessness is. And this not only for a simple man, but even for the great king himself. The secret of the Eternal is, that there is an awakening from dream; but not a rude awakening to hard realities. For fair as the dream may be, the reality is fairer; only the seers can tell of it, and even they, with broken words. In the hall of our dream, the lamps will burn themselves out; the poor flowers, cut from their roots, will fade and wither; but we shall have instead the eternal sunlight, the fresh air of the mountain-tops, the silent joy of the everlasting hills. Yet the dream is still with us; and in the early dawn, before the sunlight comes, there is a brief moment of longing for the shadows, that vanish into the full light of day. These are the three measures. Measureless is the fourth, the unseizable, into which the fivefold world has ceased, the benign and second-less. By the Self he reaches the Self, who knows it thus.